Madeleine McCann has been missing since 2007 when she disappeared while on vacation with her family in Praia da Luz, Portugal. ABC News is reporting that British authorities have requested from Portuguese police that they be allowed to question three male suspects in regards to the disappearance of then, 3 year old Maddy McCann. The three men wanted for questioning are believed to be burglars who were operating in the area where Maddy McCann and her family were vacationing when Maddy went missing. According to reports, the 3 men made a “high number” of calls in the hours after Madeleine McCann’s disappearance. 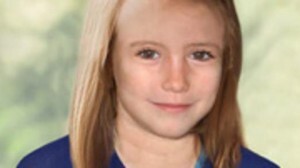 Maddy McCann at 3 years old … could there be a break in case after all these years? London police appear poised to make an arrest in the disappearance of Madeleine McCann, the girl who was 3 when she vanished while on a Portuguese vacation with her family nearly seven years ago. The arrests of a trio of alleged burglars who had been active in the neighborhood would be the result of Operation Grange, the reopening of the McCann investigation three years ago. “We can confirm that a second International Letter of Request has been sent to the Portuguese authorities by the Crown Prosecution Services this week… in connection with Operation Grange,” Scotland Yard told ABC News in a statement. The authorities would not discuss any further details. Scotland Yard is reportedly working with Portuguese police to find, detain and question three men believed to be burglars who were operating in the area where Madeleine and her family were on vacation in Portugal. After a renewed push for leads in the case of missing British girl Madeleine McCann, authorities in the United Kingdom are turning to Portuguese officials for help. A letter sent by the Crown Prosecution Services to authorities in Portugal on Friday is requesting permission to conduct interviews in connection with the girl’s 2007 disappearance from her family’s holiday villa in the resort town of Praia da Luz. Pedro do Carmo, the deputy national director of the Judiciary Police in Portugal, said Portuguese authorities have not yet received the letter, but he noted the latest lines in the Scotland Yard investigation focus on three people. Do Carmo declined to provide the nationalities of those three people, who he said have not been detained. Are UK police ready to make arrests in this nearly 7 tear old missing person’s case? For more updates, read others comments and analysis and to provide your own, go to Scared Monkeys Missing Person’s Forum: Madeleine McCann. Is it possible, is Madeleine McCann still alive? Madeleine McCann has been missing since May 2007 when she disappeared why on vacation with her family in Praia da Luz, Portugal. Scotland Yard now says it has “new evidence and new witnesses” in the Madeleine McCann case and has opened a formal investigation into her disappearance. Detective Chief Inspector Andy Redwood, who is heading what has been called Operation Grange, is in charge of a 37 strong police team is two-thirds of the way through examining 30,500 documents from files held by the Portuguese authorities, British police as well as evidence compiled by seven private detective agencies . UK Metropolitan Police have identified 38 “people of interest” in connection with the disappearance six years ago in Portugal of British toddler Madeleine McCann. 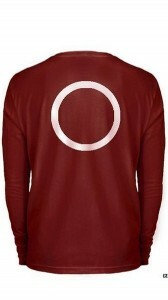 Twelve of who were UK Nationals who we believe were in Portugal at the time Madeleine disappeared. Scotland Yard says it has “new evidence and new witnesses” in the Madeleine McCann case and has opened a formal investigation into her disappearance. The Met Police said it still believed there was a chance Madeleine was alive and it was investigating 38 “persons of interest” after reviewing the evidence. 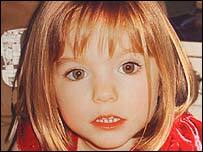 Madeleine’s parents, Gerry and Kate McCann, said the shift from review to investigation was “a big step forward”. Irish Times: Police have 38 possible suspects in Madeleine McCann case. Despite massive international interest and numerous reported sightings from Belgium and Spain to Morocco, France and Malta, and investigations stretching as far away as Australia, the little girl’s fate remains a mystery. More updates, comments and the history of the case can be found at Scared Monkeys Missing Persons Forum: Madeleine McCann. According to British police, they are investigating new leads in the case of Madeleine McCann, the little British girl who disappeared six years ago in Portugal at the age of three. Scotland Yard officials have reviewed the case, they have a list of “people of interest” whom they plan to question in connection with the little girl’s disappearance. As reported in the Daily Mail, Scotland Yard hunt six British cleaners driving a white van. Madeleine McCann went missing on March 6, 2007 from the resort that her family was staying in Praia da Luz, Portugal. It is hard to believe that Maddy has been missing for six years. Scotland Yard said it has identified several “persons of interest” and “both investigative and forensic opportunities” in the case. The force said Friday its work is under way to support police in Portugal, even though they have closed their investigation into the disappearance. “The purpose of the review was to look at the case with fresh eyes and there is always real benefit in doing so. The review has further identified both investigative and forensic opportunities to support the Portuguese. There is more than a handful of people of interest which could be explored further if only to be eliminated,” Detective Chief Superintendent Hamish Campbell told Sky News. Portuguese authorities who worked on the original investigation were widely criticized for how they handled the case. Police initially focused their investigation on Madeleine’s parents, Kate and Gerry. But the two were cleared in July 2008, when the attorney general ruled there was nothing to link them to Madeleine’s disappearance. UPDATE I: Scotland Yard hunt six British cleaners driving a white van in search for missing Maddie. British cleaners and Portuguese manual workers are among new suspects in the Madeleine McCann investigation, The Mail on Sunday has learned. Sources said ‘low-level’ workers – handymen, cleaners and gardeners – have become the focus of interest. Some are thought to have been employed by the Ocean Club complex on a casual basis and may have already been interviewed. Police are said to be keen to trace six British cleaners who were working in Praia da Luz when Madeleine vanished and who didn’t appear in the Portuguese files. Good grief, and this dude thinks he is going to get the Democrat nomination for president in 2016? More from the idiocy of Obama’s Vice President Joe Biden, Poland, Portugal … what’s the difference? From the UK Telegraph comes another gaffe from Joe Biden. Just a note to the Libs who want to defend Biden, Poland is not a member of the Eurozone, and its economy is in considerably better shape than that of debt-ridden Portugal. Imagine how the liberal MSM would have reacted if it were a Republican who made such comments? 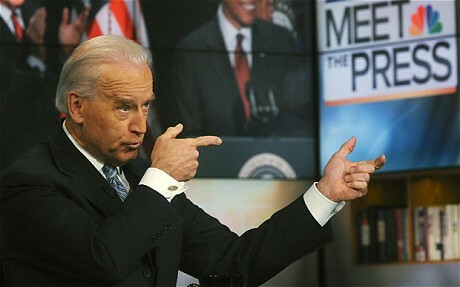 Hey, is that Biden making fun of Obama shooting a gun? Didn’t he get the memo about photo-shopping? We have seen positive steps recently to address the eurozone crisis, with the European Central Bank pledging to stand behind countries willing to launch reforms, and with Greece, Ireland, Poland* [*sic-Portugal], Spain and Italy all taking important steps to put their economies on a sounder path. Governments across the eurozone must also remain focused on growth and jobs. These may be fundamentally European problems, requiring European solutions, but their resolution has tremendous impact on the United States of America and on the global economy. Frankly, I have lost count just how many gaffes this fool has made. But some how the Democrat. Lib and MSM approach is that if you do it enough, it is not reportable. But as Weasel Zippers states, Biden’s not content being the laughingstock of America, he wants to go global. Yup, sounds like presidential timber to me.